Learn how to clone, move, rotate, animate, delete or apply an action to objects in the Web Editor. The ‘Modify’ section is only available when an object in the scene is selected. Otherwise, this section is greyed out and cannot be accessed. If you have not yet done so, please learn how to add Objects in the web editor. 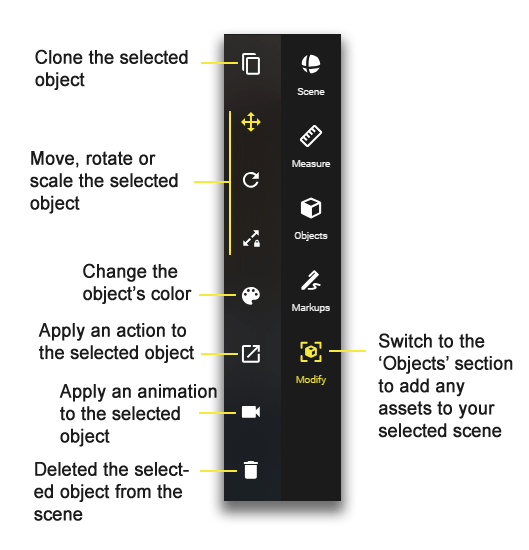 Create a copy of the selected object.Please note that the clone of the object will not have any action or animation applied even if the original object hat one. These need to be added separately. These three options can be used to move, rotate and scale your selected object. Please note that you can lock and unlock to modify the objects globally or only in one direction. Select a color to adjust the color of the currently selected object. To choose any other color, click on the larger color field at the top to open the color picker tool. Alternatively, you can right-click the object and select ‘Change color’ in the context menu. Apply a new action to your object or change the already applied action or asset. Alternatively, you can right-click the object and select ‘Actions’ in the context menu. Animate your selected object to having it move in the player view. Alternatively, you can right-click the object and select ‘Animations’ in the context menu. Select the recycling bin to delete the currently selected object. Alternatively, you can use the ‘Del’ key of your keyboard to directly delete a selected object or right-click the object and select ‘Delete’ in the context menu.